After a few years most render will start to show signs of environmental pollution. This can result in unsightly red, black or green stains. This requires render cleaning. 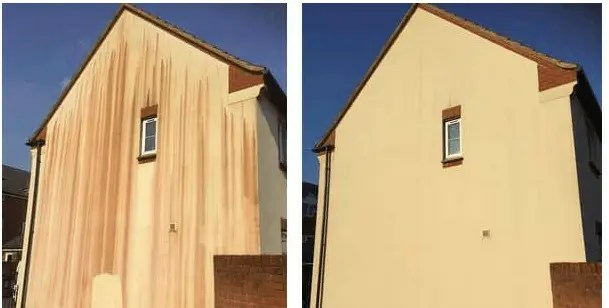 We can clean your render or K Rend using the latest soft washing technique which will remove these stains. We will ensure our render cleaning will not damage or discolouration to your property, by combining special application methods and premium quality algaecides. Not using the correct pressure will simply push the water deeper into the surface of the render course, causing damage. This water could ingress will then freeze when hit with cold temperatures that winter brings. This freezing can in turn leads to cracking. Also Incorrect pressure will not kill of mould spores completely and mean they continued to growth for weeks to come. Whether you are using a render like Moncouche, K-Rend or Weber, you will get algae and mildew staining, as well as a change in colour due to weathering affects and pollution. The Cardiff Window Cleaning Company uses a low pressure washing method to get rid of accumulation on your rendered walls in a way that is gentle enough to not harm the render. If you use a high pressure washing system to clean render, it can damage it, but softwashing will not. This restores the natural beauty of the render, making it look like it was just painted. In most instances, we are able to return your rendered wall to its original spotless look, even if it has had a pebble and spa dashed finish. On the sides of your building where there is little sunshine, particularly the north and east sides, your render is likely going to look even less appealing there. Weathering can cause green staining on rendered surfaces, and this is far more likely on buildings that are close to water. That’s because humidity can cause the infection to grow. There can be spores from trees and other greenery nearby that is promoting biological growth on the building. These stains, if not treated soon enough, can leave behind unsightly stains. Because of the warm, humid weather the UK enjoys, growths like these will do very well, quickly covering and discolouring building render. That means that buildings in this kind of climate need to be cleaned more often than those in colder, less humid climates. If you try to remove them on your own, you can run into some trouble. It’s tempting to use high pressure washing system to get rid of it, as that blasts away the accumulation quickly. If you don’t wash thoroughly enough, though, then the infestation will come back quickly. We use a proven soft wash treatment that is gentle on your building’s render but tough on biological infection. This makes your building look fantastic and ensures it can retain its beauty for a long time. Once render starts to stain, many people think that they need to repaint their entire building, but that’s not necessary. If render is kept clean, then it retains its colour. It’s as simple as that. It’s far more cost-effective to have the render cleaned, and in the past, it was only possible to fully clean it using a high pressure washing. Now, with our soft washing services, we can avoid the damage caused by high pressure cleaning. This is a gentle cleaning system that uses a pH neutral detergent to get rid of the infestation. It restores the natural finish of the render and allows it to retain its finish for along time to come. Once softwashed, a render can keep its look for several years, lasting far longer than previous cleaning and maintenance methods would allow. In addition to render cleaning we can also take care of your patio’s, walkways and with our pressure washing services.